The first Divination Blog Hop for 2014 has come and with it, the Chinese New Year of the Horse, birthdays, a dose of healing and creativity. It’s a creativity and healing theme with this Imbolc Blog Hop. Can the Tarot heal? Well, like anything else, if you’re open to the idea of it, yes, anything is possible. It’s important to understand that no one can be healed until they’re ready to be healed. The body will usually heal, that’s what bodies do but the Tarot deals with the inner self, the shadow self, the parts that people can’t see are damaged until their actions speak louder than words ever do. 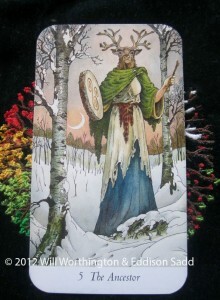 There are two Major Tarot cards that The Wildwood creators link to this time of year and as we transition slowly from the shelter of Stones to the new thoughts of spring, I thought I’d ask the Tarot to show us how both can be read for creativity and healing. Take The Ancestor card, shown here. What does she say to you about healing? Listen to the past, perhaps? Listen to your elders and trust their words and wisdom? Do you listen to those that know better, such as doctors or those who are better trained than us? Creatively, it can mean listening to your inner wisdom, the wise voice within. The other card for this time of year is The Pole Star, which sits more on the creative side than the healing side, but can still do both as we are often inspired when this card comes up. What are your dreams? Have you worked on their details? Are you aware of what your dreams are? Have you taken the time to create any dreams? Or listen to the ones your soul is trying to tell you? It’s always great when you can lift your head up and see the light. 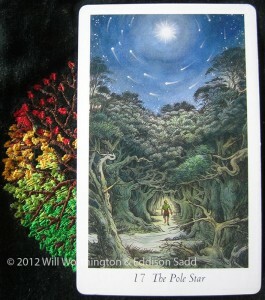 The swirl in sky for this card is the design the stars make in the sky as the earth turns through the night. I thought it was an error, until it was explained by John. It’s great when something is explained, simplified. For me, these two cards alone allow for creativity after listening to the ones that are wiser and have more learned knowledge. A little like my wonderful mother, recovering from what, we don’t yet know, who now has the time to be creative (Pole Star) after listening to the wise words of the doctors (Ancestors) and following their advice. No doubt the cause of her illness will out with the scans and procedures that are to come, but until then, there’s time to make dreams and to work towards manifesting them. What do your ancestors tell you? What are your dreams? How will you manifest them? 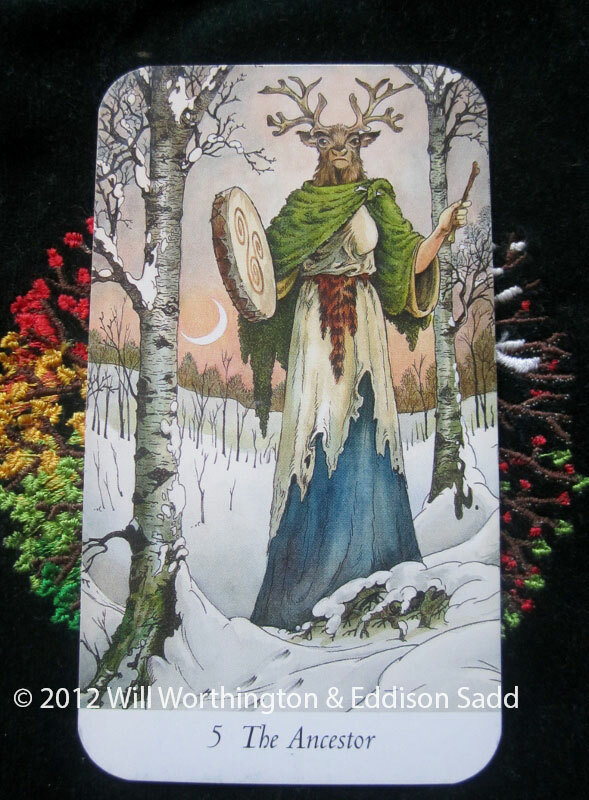 So for Imbolc, let both these cards inspire you, take comfort in the stones that build our homes and have a full, blessed Imbolc. You can’t heal those who aren’t ready to heal. Amen to that! I wish your mom well with her recovery! The spread is lovely and valuable – I don’t think we listen to our ancestors nearly as much as we might! “no one can be healed until they’re ready to be heal.” That is such an important piece of wisdom! Thanks for sharing the Wildwood Tarot, and for the great spread!